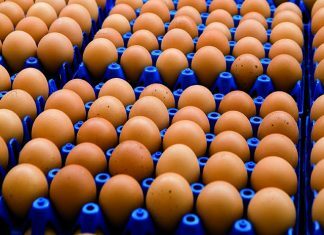 The prevalence of D. gallinae in Europe and other parts of the world is very high and cause high economics losses, which estimated by130 million per year for the EU egg industry. 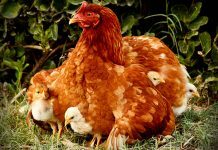 In semi intensive farming systems such as barns, free range or organic farming often a higher prevalence rate could be observed due to better hiding places for D. gallinae in these more complex housing systems. Due to developments of resistances and current and future expected legal regulations, treatment options are limited in the EU, especially in organic production systems. Alternatives to chemical acaricides for control of D. gallinae are silica products, which are based on silicon dioxide. Silica products have a low oral toxicity and there is no safety concern for silicon dioxide intake up to 1500 mg SiO2 per day for humans . Furthermore, they are registered and approved as a food additive and silica products can be applied in the presence of hens at high infestation with D. gallinae in practice. In practice, there is a large variety of methods to apply silica products. Thus, we investigated schedules of application of silica products in organic layer farms. In addition, we tested the efficacy of some products under field conditions throughout laying period. The study included 17 organic layer farms located in seven Federal States of Germany. Flock sizes varied between 500 and 3000 hens and housing conditions differed regarding construction (massive or mobile houses) and equipment (multi-tier or single-tier systems). 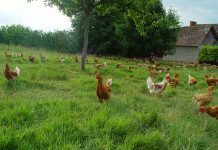 Infestation with poultry red mite was determined by the use of mite traps in the 1st, 12th and 24th week after housing of young hens in the laying farm. The mite traps used was a modified development of traps as described by Safrit and Axtell (1984) consisting of a plastic tube with a corrugated paper inside. The number and distribution of mite traps in the house was carried out as described by Cox et al. (2009). At the above-mentioned intervals the 36 traps were collected, frozen and up to a number of 350 mites per trap PRM were counted. In the case of higher numbers, the number of PRM was estimated by weighing the content of traps. Approximately 20 % of the weight was counted in order to extrapolate the total number of PRM. Additionally, in 15 of the 17 farms at the 24th week a visual monitoring was carried out according to Cox et al. (2009) at 36 control points to compare both methods. The Mite Monitoring Score (MMS) varied from score 0 (no visible PRM) up to score 4 (visible accumulation of PRM with an area over 1 cm”). 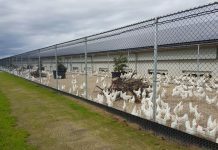 For each farm we recorded whether the farm applied a preventive treatment with silica prior to housing of hens, whether farms used an own monitoring method to determine the mite infestation, and whether mite control treatments occurred during the survey period. First of all, the results of the infestation survey were subjected to an exploratory data analysis. In order to compare the different farms the absolute numbers of PRM and the relative change rate in the number of PRM from the second to the third sampling was calculated. For this, the absolute change in the number of mites was determined from the second to the third sampling and calculated in relation to the number of PRM at the second sampling. 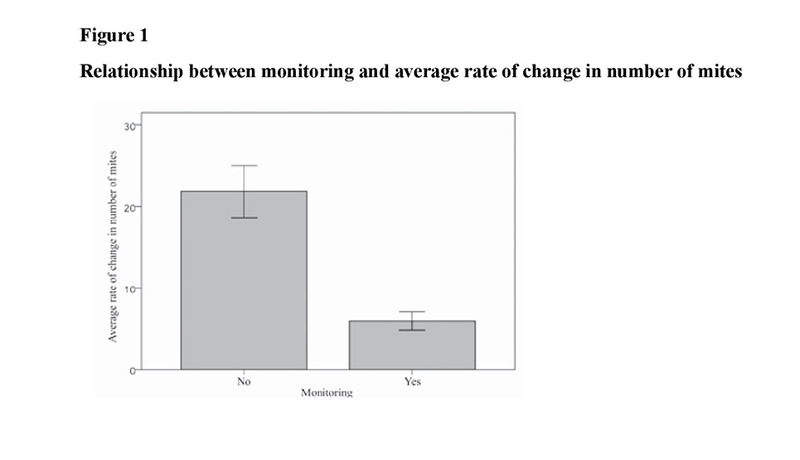 This resulted in the relative increase between the second and the third time of the survey. The relationship between mite monitoring and average rate of change in number of mites was tested using the t-test. Effects of mite monitoring (yes/no) on the relative change of PRM infestation was tested using Mann-Whitney-U-Test. Altogether, 11 of the 17 included farms preventively applied silica and eight famers carried out their own monitoring method. 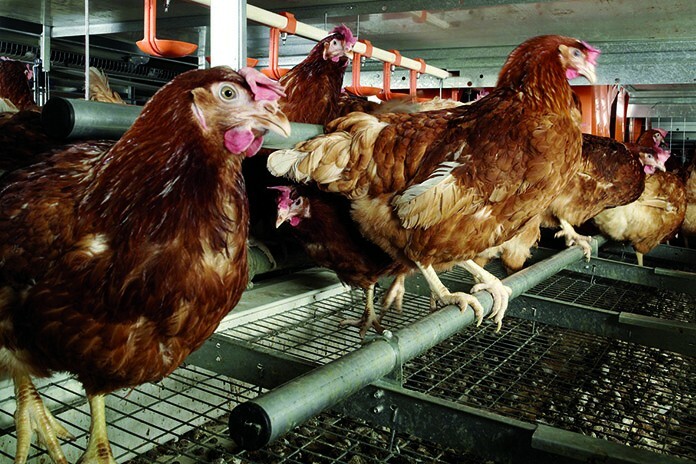 Application of the silica in presence of the hens was carried out in six farms. In case of an increased number of PRM during the laying period they could respond promptly due to this monitoring. A total of seven farms neither did a monitoring nor did apply silica in the presence of laying hens. In the farms without monitoring the number of mites increased significantly between the second and third survey sampling for more than 20 times, while on farms with monitoring an increase of 5 times was found. The average number of PRM per trap varied depending on the farm and the date of sampling. 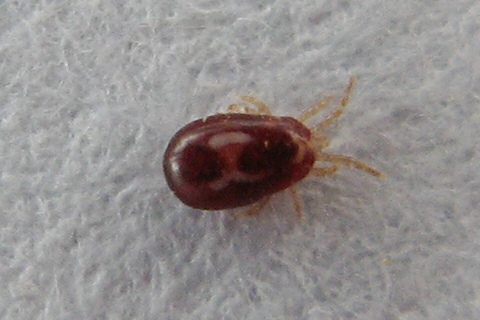 For the first sampling time, at the beginning of the laying period, the average number of mites per trap varied between 0 and 123. At the second sampling time the average number of mites per trap varied between 0 and 2.200, and increased up to values between 0 and 8.500 at the last sampling time. The comparison of visual monitoring by MMS and monitoring by our modified mite traps showed that with these traps small mite infestations could be detected in contrast to MMS. In investigated organic layer farms different control strategies and mite infestation monitoring program were applied. Some farms used silica as preventive and acaricides as treatment. The obtained results revealed that monitoring and preventive silica applications are important components for successful mite control and management. 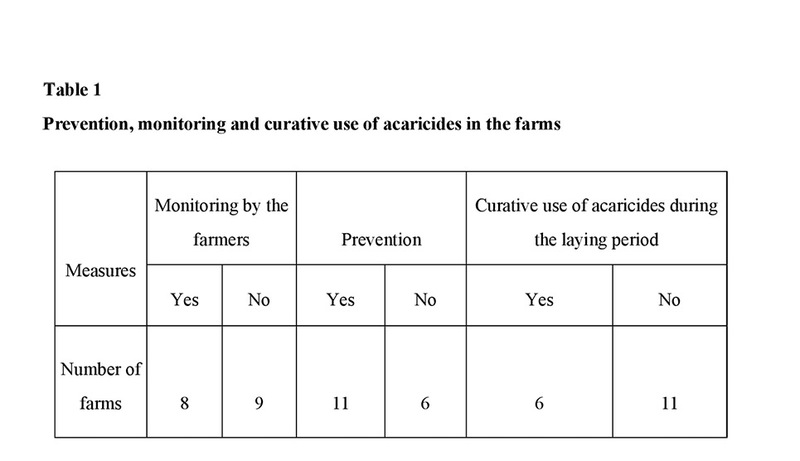 Farms with curative use of acaricides did not show a lower mite infestation compared to farms without such measures. The reason for this might be that highly infested farms may more readily use curative application than farms without obvious mite infestation. For the planning and application of control measures, it is important to have knowledge about the PRM infestation levels on farm for future management measures. The modified mite traps used in this study are proved to be practicable and can be recommended for the determination of mite infestation in laying houses.